Despite their loss to the Bobcats, the Lady Jeffs will live to play another day; they face Lassell College in the NESCAC Tournament on Saturday. The women’s soccer team may have lost the battle, but they have yet to lose the war. The Jeffs fell to Bowdoin in a penalty shootout after two overtime periods failed to separate the teams. The Jeffs felt confident going into the game. They had just defeated Colby 1-0 in a game that was not as close as the score line indicated. Earlier in the season, they had handled the Polar Bears 4-1. The stage seemed set for an Amherst at Williams NESCAC Final, but Bowdoin played the role of spoiler. Bowdoin struck first in the 36th minute when Audrey Phillips ’16 scored off a cross, narrowly beating Jeff keeper Holly Burwick ’16. The Jeffs would equalize less than three minutes later, as Amanda Brisco ’14 took advantage of a shaky clearance by the Polar Bear defense. Brisco’s goal last weekend against Colby gave the Jeffs 1-0 response they needed to advance. Tied 1-1 at halftime, the Jeffs came out of the break and took control of the game. Sandy Shepherd ’13 headed in a Kathryn Nathan ’13 corner in the 63rd minute to give the College a 2-1 lead. But the Jeffs were not done there. Brisco struck again off a shaky clearance just three minutes later to pad the lead, 3-1. Bowdoin responded immediately, as Jamie Hofstetter ’16 drew a penalty from Maya Jackson-Gibson ’15. Hofstetter converted to reduce the deficit to 3-2. Bowdoin found the back of the net again in the 73rd, when Morgan Woodhouse ’14 sent a hard cross in from the right side to Abby Einwag ’15. Einwag’s goal tied the game at three, where it would stay until penalties. Nathan and Mel Stier ’15 converted the first two kicks for the Jeffs, which were matched by two Polar Bear makes. Sophomore Ariana Twomey’s shot was saved, and the ensuing Bowdoin shot came out off the crossbar. With the tally at 2-2 through three rounds, Emma Rothkopf ’15 and Jessy Hale ’16 both converted for Amherst. However, Bowdoin matched them to force extra frames. Chloe McKenzie ’14 converted, but the result was watched. Sophomore Alex Hart’s shot was saved, and the Polar Bears’ ensuing make was the decisive blow. 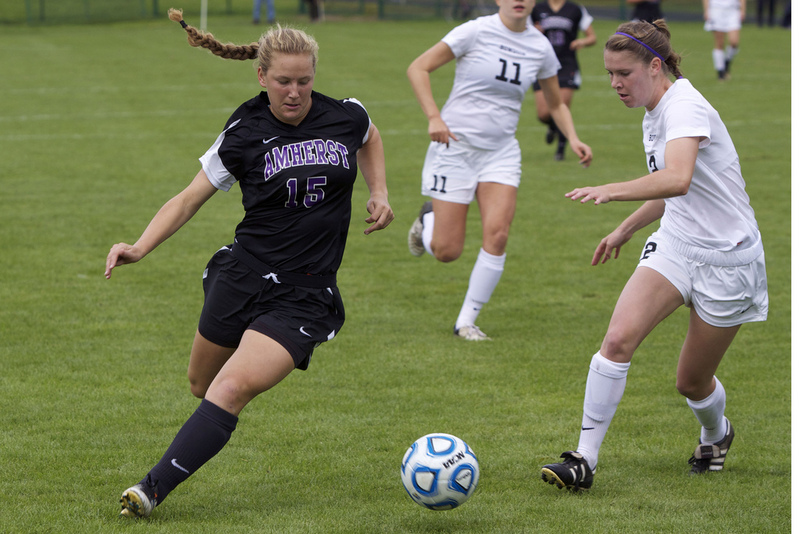 Though the College fell in the NESCAC Semifinals, their season is not over. The Jeffs, by virtue of their sixth overall NCAA ranking, have qualified for the NCAA Tournament, which is a knockout-syle format. The Jeffs next play host to Lassell College (Newton, Mass.) in an elimination game. Should they advance, they would face the winner of Union and Brandeis Sunday at 1:30 p.m.